The sun picked Thanksgiving Week in the U.S. to become active once again, part of the reason this blog and the associated web site SolarFlareWatch.com have been a bit behind in updating. Starting with the most recent updates first, SolarHam.com just posted a fascinating image from NASA/SDO showing a large channel across the southern hemisphere of the sun. 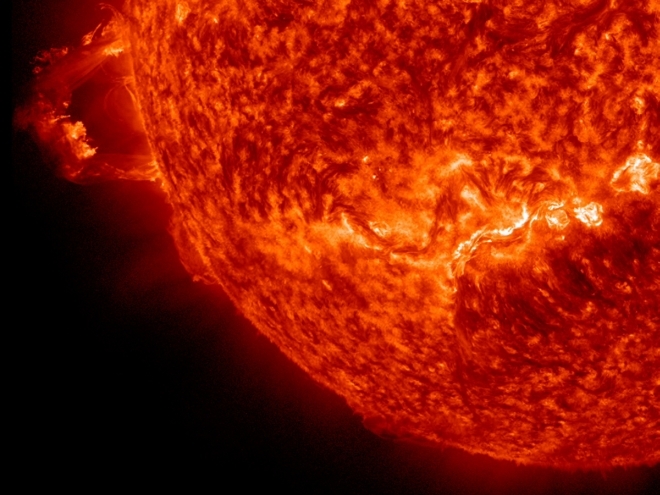 According to Discovery News, "NOAA space weather forecasters believe [sunspot] AR1618 could generate an X-class solar flare -- the region has a 'delta-class' magnetic field, a configuration that has enough energy to produce the most powerful of solar eruptions". SpaceWeather.com also notes Sunspot AR1618's potential to create Earth-directed X-class solar flares on November 23, though the sunspot's potency is diminishing. 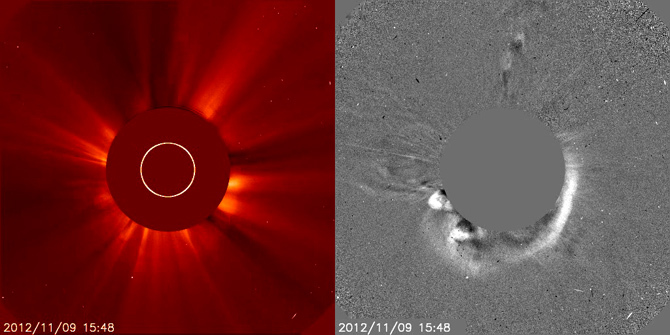 SolarHam.com indicates that the chances for a strong flare have passed due to the sunspot's deterioration. An X-class solar flare is the most powerful on the scale and can potentially disrupt satellite communications and power grids. SpaceWeather.com is also conveying NOAA's prediction of "a 60% to 65% chance of polar geomagnetic storms on Nov. 23/24". This is due to a CME on November 21 and yet another on November 20, as reported by NASA. According to NOAA, the first storm period is expected to be mild, anticipated around mid-day on November 23. However, NOAA says "major storm levels" could occur early on November 24, though SolarHam.com predicts no more than "Moderate" levels. Earlier in the week, multiple news organizations covered a pair of non-Earth-directed solar flares on November 16 that would have had major impacts on Earth had they been headed towards Earth. An interesting Fox News report on November 19 described the event as a "solar tsunami", with popular physicist Dr. Michio Kaku discussing the potential impacts of the sun entering an active period. NBC Nightly News also reported on what NASA described as "Double Trouble" flares. Stay tuned for more updates to this blog, as it would be wise to keep a close watch on the sun the next couple of days.